The traditional holiday resort of Meiringen lies in the Hasli valley, south east of Lake Brienz. Sherlock Holmes met his maker here – only to be resurrected again several years later. Meiringen-Hasliberg lies geographically in the centre of Switzerland between Interlaken and Lucerne in the eastern Bernese Oberland. The Valley is embedded in the famous alpine passes of Grimsel, Susten, Grosse Scheidegg and Brünig. Many attractions are associated with the icy glacier waters from the nearby mountains; the Aare gorge for example has been created in the rocks by the flow of glacier water over millions of years. A walking platform leads through the gorge between the horizontal, scarped rock faces, just above the turbulent waters. Another wild glacier gorge with a boldly constructed footpath in the romantic Rosenlaui valley is certainly also worth a visit. A nostalgic funicular leads up to the mighty, tumbling Reichenbach Falls; the smaller, lower waterfalls can already be admired during the ascent. The viewing terrace of the mountain station affords an excellent view of the flooding waters of the 120-metre-high Upper Reichenbach Falls. In the murder mystery, the master detective Sherlock Holmes is supposed to have plunged into the depths here to meet his end, a museum and memorial here are dedicated to the author Sir Arthur Conan Doyle and his famous fictional sleuth. Because Holmes’ readers didn’t want to accept this death, Doyle was forced to allow him to show up again three years later. Meiringen lies at the base of the main ski area on the valley floor at 595m. The resort has easy access via train or car and has all the local amenities you could ever need. During the main ski season there are 2 red runs that flow down the the village on either side and this lower resort offers more in the way of nightlife, range or accommodation and large resort vibes. The drawn out Hasliberg panoramic terrace, ranges from Hohfluh to Reuti all at around 1,050m, can be reached from Meiringen via a cableway, or by the Brünigbahn and post bus. All of these mini resorts can be accessed via the ski area either by skiing or a ski bus. They all have a slightly different atmosphere and offer a range of stunning hotels from the new boutique places to the cosy and simple. The Haslital area has been awarded the Families Welcome quality mark and offers children’s en­tertainment, child care facilities, toy libraries etc. With well over 20 restaurants there are plenty of options for food in these small resorts. They do everything from the Swiss Classics up to most other European options. There are plenty of little cafes for the quick bites, and these are lined up along the main street with small tables outside. The resort is not renowned for being a heavy party town, however there are around 10 lively bars for the younger generation. If this isn't your taste, there are also quiet bars to relax in with a nice glass of wine. The holiday region Haslital in the Bernese Oberland is the perfect destination for winter snow sport fans, winter hikers, nature lovers, seekers of rest and relaxation, culture lovers and families. Unforgettable winter experiences are guaranteed. The winter sports area of Meiringen-Hasliberg offers 14 modern ski lifts and access a ski area of 60km of groomed slopes up to 2,433m above sea level, 40km of winter hiking trails, 38km of cross country circuits, 20km of snow-shoe trails and 15km of sledding runs. Action is guaranteed for kids as well… Skihäsliland at Bidmi offers perfect learning area for little ones – real playground in the snow! Cross country fans can ski to their heart’s desire – the circuit in Gadmen is definitely an insider tip! This 15 km long circuit winds its way along the «Steinwasser» river bed and comes back around to the village of Gadmen. 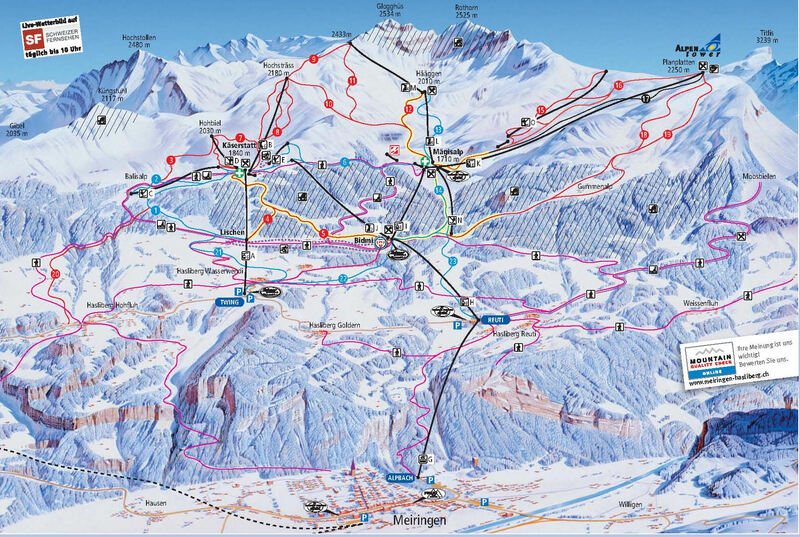 This ski pass covers all the lifts in Meiringen-Hasliberg area. We have 2-person studio apartments and every size, right up to 10-person apartments. They are spacious and convenient to amenities, the ski lifts and free village ski bus. Our prices are simple, LOW & HIGH season. We have Youth prices for up to 20yrs old and even bigger savings for Children under the age of 16yrs!